the customer for clear agreements are helpful. For all current and future transactions between Laeti-Berlin and the purchaser, the following general terms and conditions apply. 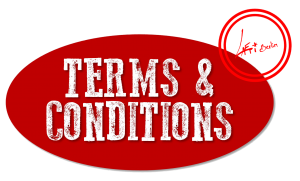 These terms and conditions are, at the latest recognized by placing an order with accepting my delivery. The prices indicated on the website are in Euros and do not include shipping. Prices are quoted in euros, TAX is not applicable. It will be added delivery charges whose amount is determined by the weight of the package. In case of an overhead E -Mail will be sent to confirm your order. If delivery takes place outside the territory of the European Union, customs duties and formalities relating thereto are the sole responsibility of the consumer. The customer then agrees to verify the compliance of the delivery with regard to the country of delivery. We reserve the right to change our prices at any time, but we are committed to applying the rates that were displayed at the time of your order. The purchase price is payable as soon as there is an order. Goods can be paid by bank transfer to my bank account or via Paypal. Payment by mail is not accepted. I exclude any liability for loss. My bank details are available only after completing the purchase. Goods will be shipped upon receipt of payment. Requests for damages with Laeti-Berlin and for delays are excluded. Delivery is made on behalf of and at the risk of the purchaser. Until full payment the goods remain the property of Laeti -Berlin. – For the supply of goods which are produced according to customer requirements. It is important to take into consideration before purchasing the traditional character of the production of objects. All items sold here are entirely handmade with all possible attention and are considered as unique pieces . It is possible that you will receive an article with small differences in comparison with the pictures in the shop. All photos and designs on this site are the exclusive property of Laetitia Hildebrand. Copying any material (illustrations, pictures and texts) without the permission of Laeti-Berlin / Laetitia Hildebrand is not allowed. Any reproduction or distribution of any kind, in whole or in part, personal or commercial, is prohibited except by agreement between the parties. If you want to distribute my products in your store or online shop, ask the pro rate via the contact form on the site. Laeti-Berlin strives for 100 percent satisfaction, so if you feel dissatisfied with your order let me know right away. Once an item is purchased I do not offer cancellations, returns, refunds or exchanges – All Sales Are Final. If your purchase has not already been mailed with the postal service, you can e-mail us and we will work out a solution. If the order has been mailed already, we cannot offer any kind of return or refund. You have a period of 14 days from the delivery of your order to return products ‘Laetitia Hildebrand’ for exchange or refund. Items must be in the condition you received them. Return costs are still your responsibility unless the return is due to an error on our part. Please contact us before sending the items back and let us know what went wrong. So we can find a fast and convenient solution. Owing the rules of Small business enterprises (in Germany: gem. § 19 UStG), I have no sales tax and can not identify this as well. Only the law of the Federal Republic of Germany for all disputes arising out of the contract.The provisions of the UN-sales law (United Nations Convention on Contracts for the International Sale of Goods) are excluded. Thank you for taking the time to read these Terms, and happy shopping in the online store!